Stainless steel is quite literally everywhere, from buildings to product packaging and from storage containers to kitchen utensils; the material’s possibilities are endless. Due to its marvellous material properties, stainless steel has formed a fundamental part of our everyday lives from construction to transportation and household appliances. In fact, the majority of our most impressive architectural structures contain stainless steel in them somewhere; as more than 1.3 billion tons of the stuff is produced each year. So how is this material used for liquid container purposes? Intermediate bulk containers (IBCs) are designed to store and transport liquid and granulate substances such as food ingredients and pharmaceuticals. Stainless steel is used to manufacture many IBCs for a number of beneficial reasons, of which you can find below. Corrosion Resistance – All stainless steels are resistant to corrosion and therefore do not rust as quickly as other metals. For atmospheric conditions low alloyed grades are best suited; whereas highly alloyed grades better resist corrosion in acids, alkaline solutions and environments with chloride. The latter is especially true in raised temperatures and pressures. Temperature Resistance – Many stainless steel grades will resist scaling at ridiculously high temperatures and maintain strength. On the other hand, many other grades will show exceptional strength even at cryogenic temperatures. Fabrication – Most stainless steels can be cut, formed, welded, fabricated and machined readily. Strength – Material thickness, weight and cost can be reduced by the cold work hardening properties of stainless steel. The material can also be heat treated in order to establish extremely high strength components. Hygiene – The hygienic properties of stainless steel make it the ideal choice for hospitals, food processing facilities and pharmaceutical plants. Lifespan – This durable and low maintenance material lasts for an extremely long time. In fact, when compared with the lifespan of other materials, it is the least expensive option. Here at Delta Containers, we have supplied stainless steel IBCs to a wide range of different industries for some time now. We understand that each individual company and application requires a unique and tailored container. So we are proud to provide both standard models and bespoke solutions for all of your IBC needs. From food processing plants, to farm shops and pharmaceutical plants; we’ve supplied it all! 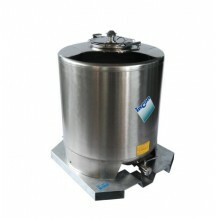 We also provide the option of having heated or chilled stainless steel IBCs, perfect for food ingredient applications. Contact us today for more information on our stainless steel IBC capabilities.